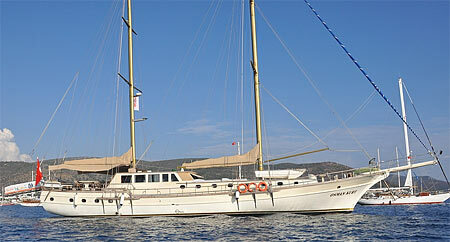 BLUECRUISE:ORG is a company settled in Bodrum for many years. Specialised in arranging boats for for personal needs and consulting. All facts given here for the recommend boats are based on own experience and knowing the owners. Please ask us for best offers, we will also look after your personal wishes. is a newly refurbished superb motor sailor designed for full charter. She has four cabins containing a double bed, and four cabins with twin beds. All cabins have ensuite bathrooms with home style toilets and shower cabins. She comes fully equipped with VHF radio, GSM telephone, dinghy with outboard, stereo music system, windsurf, canoe, fishing and snorkeling equipment, generator and continuous hot water. There is an extensive, roomy galley to rival that of fine hotels, complete with all accessories and household appliances. With a length of 30 metres (100 feet) M/S OSMAN KURT offers enormous space on and below deck. (Captain, deckshand and chef) of course are accomodated in separate crew quarters. Comfort/Recreation: Spacious sun deck area with Sun mattresses and cushions, Sun awning, Cushioned aft deck with a large table, Deck chairs, spacious saloon with bar and dining table. There is nearly none of the gullet charter-companies who tells you the truth about the use of air-condition on Gullets. Yes, M/S OSMAN KURT has AC and you think you can switch it on when you like. It's not! On a boat the AC can only run when the generator is on, or in a harbor when connected to 220 Volt. But mainly you are in anchor bays, often next to a neighbor who doesn't like the noise of your generator and you wouldn't like it either during the night for example. The M/S OSMAN KURT meets international safety regulations including life jackets, fire extinguishers and alarms.